Cold press PFH/30/3 ORMAMACCHINE, fix platen 3000x1300 mm, movable platens sup. 3x1000x1300, total thrust 90 Tn, 6 pistons, stroke 500mm. 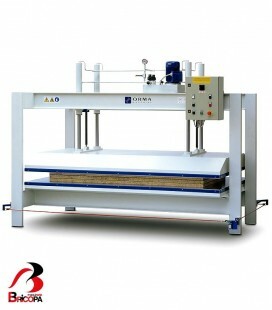 Upon request: movable platen split in 2 or 3 sections. The bottom platen (planed beam structure) foresees a series of wheels to ease up the loading/unloading phases. These wheels, not powered, are spring loaded and disappear into the beam slots during the pressing phase. Press structure made out of steel sections welded together, for a sturdy construction and lifetime guarantee. 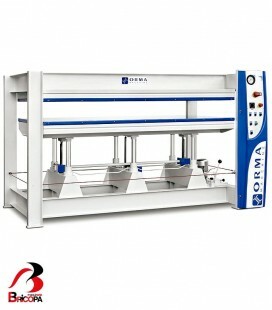 Locating surfaces are CNC tool machined. 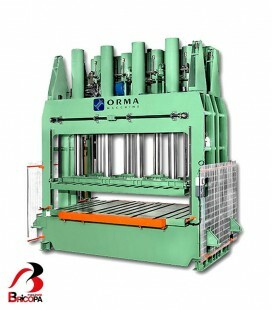 Press platens made out of planed beams, guarantee of the best flatness and parallelism between them. 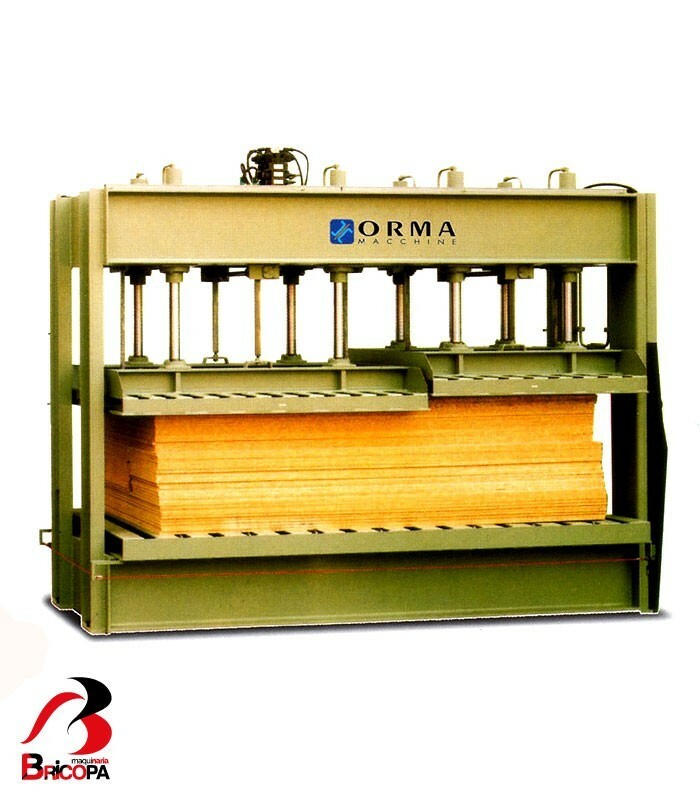 The platen parallelism is also granted by a double rack and pinion system (both length and crosswise). The movable platen can be split in 2, 3, 4 or more sections (upon request). Hydraulic system it is complete with hydraulic power unit fitted with a double stage pump (first high delivery at a low pressure and then low delivery at high pressure); the automatic recovery of possible loss of pressure is also granted by the system. Hydraulic cylinders are manufactured under exclusive Ormamacchine design; rams are hard chromium plated to grant a better wear proof. Presses with split platens: it is possible to set different working pressures on each individual platen. Main control board is fitted with all controls to set and to run the press. All models are CE rules complying and fitted with compulsory safety devices. 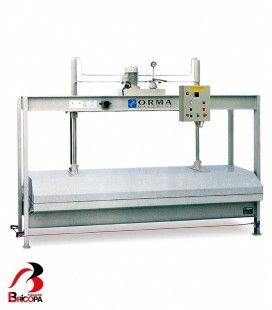 Optional extra upon request: press automatic opening by timer; rams’ extra stroke; electrical control to operate split platens at the same time.